Our first stop on our Red Flag 16-1 trip was Creech AFB out in Indian Springs, NV. It’s about an hour west of Nellis AFB and is home to the USAF’s Predator and Reaper UAVs (Unmanned Aerial Vehicles). It is also the location where the USAF Thunderbirds practice when they are home at Nellis. As we drove past the base we saw a MQ-9 Reaper on the ramp and a couple of MQ-1 Predators in quonset huts. We heard a little chatter over the scanner so we pulled over to listen for a little. The Thunderbirds were practicing in the valley to the north of the airfield that way they could practice without affecting the regular operations at Creech. After a little more radio calls a Predator took off in front of us and slowly turned toward the north. We headed down the highway for Nellis so we could watch the launch for Red Flag and catch any other Nellis ops happening. At Nellis, the Weapon School and operational training squadrons were conducting their regular ops and we got some nice launches. Four F-35s took off to go do some training to help push the F-35 program to full operational status, a couple of F-15s pulled a flex departure and banked right over us, and a couple of Raptors headed out to train as well. A Green Flag exercise was in its final week of ops and there were flights of A-10 Warthogs from the Idaho ANG flying missions to train with ground forces out in the desert. This Red Flag hosted aircraft and aircrews from the Royal Air Force & Royal Australian Air Force alongside our forces. The RAF brought there E-3D AWACS (Airborne Warning and Control Systems), a Sentinel, a C-130 Hercules, and Eurofighter Typhoons. The RAAF brought their E-7A Wedge Tail, F/A-18A Hornets, F/A-18F Super Hornets, and an AP-3C Orion. In most Red Flag exercises the command and control and heavy aircraft usually take off first. The RAF Sentinel was the first to launch followed by the E-3 AWACS, EC-130 Compass Call, and KC-135 tankers. Many of the electronic aircraft only fly once a day and alternate when they will, depending on the week. This week they were going up for the night ops and would switch in the following two weeks. We saw the B-1s launch on max afterburner, and then the mass launch of fighters started. There were about fifty to sixty fighters, plus the heavies, scheduled to launch at this Red Flag. The launch took about two to three hours to complete. 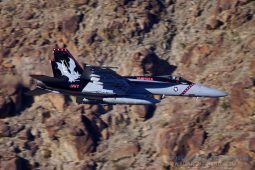 Most of the Aggressors do a flex departure on takeoff in order to take the quick route west to get over to Beatty, NV where they setup the airspace for the battle. 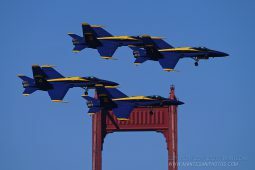 Usually the blue force fighters line up at the end of the runway, usually two to four aircraft, and then launch one at a time until the entire flight is up. Some do launch in a section flight with two aircraft taking off at the same time. The mass recovery is always spectacular and can be intense at times depending on the flow of aircraft traffic on the ground. 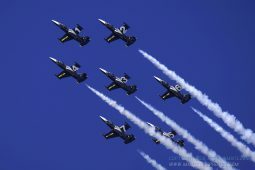 The fighters start flying in over the base in formation and then break to land. They break both ways so you usually get some fighters banking over the road in the pattern to land providing for some good photography angles. It becomes a steady stream of aircraft landing on both runways slowly filling up the taxiways with fifty to eighty aircraft all coming back to base. The heavies usually come straight in for a landing, but the B-1s usually come in together in formation as well and do a break and go around in the pattern. The Red Flag recovery is usually right around the time that some of the Weapon School aircraft launch for their second sortie of the day. They usually take off the same way the Red Flag aircraft are landing, but there have been times where they take off in the opposite direction as the landing aircraft. The aircraft taking off thus usually stay low and turn to clear the airspace for the landing aircraft. After another two to three hours, all of the Red Flag aircraft are recovered and are being prepared for the night sortie. The night launch follows the same order as the day launch. The heavy aircraft consisting of the command and control aircraft, electronic aircraft, tankers, and bombers will all launch first followed by all of the fighters. The second set of aircrews fly the second mission giving everyone from the first exercise a chance to do a full debriefing and get enough rest for tomorrow’s mission. Usually the night flights are always filled with all of the heavy electronic aircraft (E-8, EP-3s, RC-135, etc.). The B-1s that launch at night are an incredible sight with the full afterburner cones being extended all the way out to the tail of the aircraft. They also leave the afterburners on for quite a distance so the heavy bombers can get to their start altitude faster. The fighters also launch using afterburners, producing smaller white afterburner cones. After about an hour and a half to two hours all of the fighters have launched and the base falls silent again until all the aircraft begin to return close to midnight. For our second day at Red Flag, we decided to head out into the desert out around Rachel, NV to watch the actual exercise. We got into the Tikaboo Valley and we started to hear some radio chatter from Groom Lake (better known as Area 51). The callsign being used was “Reach” which usually belongs to a C-5 or C-17. 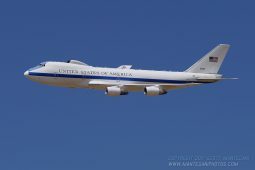 It sounded like it was leaving Groom Lake for Washington state. Our first location to check out was Coyote Summit, which we climbed before and were thinking of doing again. We decided against that because it was thirty-five degrees out, there was going to be a wind chill factor, and there was a foot of snow on the ground. We decided to try a valley further north where we had also visited before, but first we stopped in Rachel at the Little A’Le’Inn. The place we were going to for the day was the road to the Cedar Gate of the NTTR (Nevada Test & Training Range). It is a big open valley and a couple of miles north of the gate is the Keno Airfield. We set up just off the road about two miles away from the gate so we wouldn’t be a big concern for security……hopefully. One government pickup truck came out to us from the gate and the driver asked what we were doing. We said we were out here to watch the Red Flag exercise and he said we were good where we were, so there were no further worries. We started hearing some sonic booms out in the distance, at times multiple together. 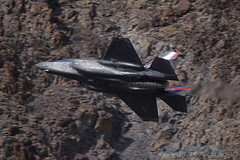 In total we heard about dozen sonic booms, and then we saw four F-35s heading south back to Nellis. After they left, the scanners were silent for hours until we heard calls coming in for the Red Flag exercise. 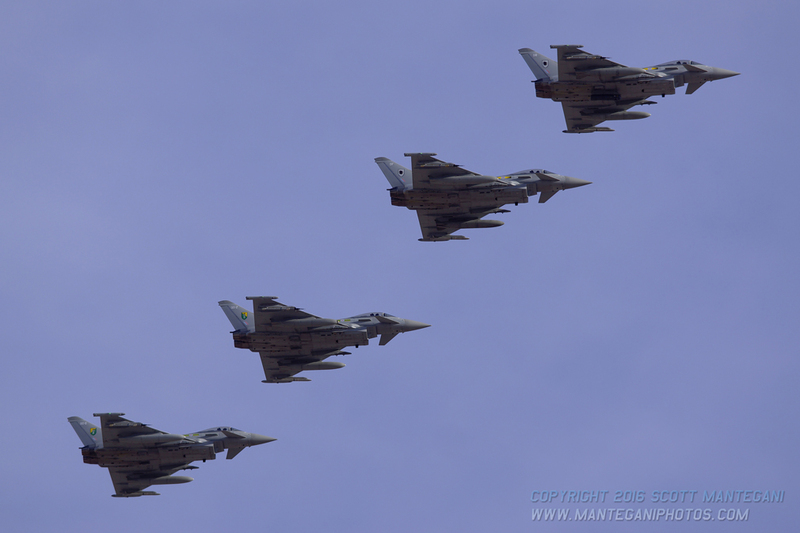 The aggressors were setting up the airspace, and we began seeing some of their contrails to the south. Then there were a couple of aggressor contrails to the west, and another group to the east making up the blue force. They then all started to converge on each other as the air battle commenced. The first groups all took their simulated missile shots and then all turned in a formation to evade the enemy missiles. After the first shots were fired, the groups closed in and the air battle commenced over us with some good ACM (air combat maneuvering). 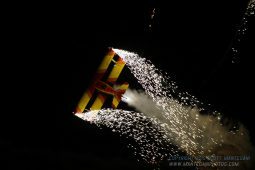 There were Typhoons maneuvering and dropping flares to avoid enemy missiles. Aggressor F-16s were jinking and pulling evasive maneuvers to get away from the blue force fighters engaging them. More F-15s would come in, fire their missiles, and then turn away from the fight. Navy EA-18G jamming aircraft could be seen out in the distance jamming enemy radars. There were no low level flights in this area, but the entire center of the air battle was right above us. A couple of aggressors headed back west quickly to retreat out of the airspace from the battle. They were low on fuel and had to get to their tanker. Just as quickly as it all began, it ended and the desert grew silent again as all the jets were headed to the tanker aircraft to get enough fuel to make it back to base. We headed back to Vegas and left the scanners running to see if we could pick up any transmissions from the tankers and the rest of the flights heading back to base. Groom Lake was still busy and we heard another cargo aircraft using the Reach callsign, but this time it was cleared to land at Groom. The Weapon School and operational training squadrons were up for their afternoon/evening flights and we were hearing those radio calls. We spotted Raptors up above us pulling contrails and maneuvering out over Ash Springs. Later an F-15 flew well above us on his way out to the ranges to fly a mission. Four F-35s were up flying again getting some more testing in. We got back to the base after dark and waited for the night launch. The launch was rather slow, taking quite long for them to start taxiing out the heavies. We figured we’d watch the B-1s and then call it an evening. The P-8, P-3 and AP-3C all launched, so they were still on their night only exercise for the week. The E-8 JSTARS taxied out but then turned around with a problem and didn’t end up going out for the exercise. While we were waiting, there was an engine test being conducted at one of the engine test hush houses. We could see the heat rising out of the building and whatever aircraft it was from was very powerful. It was an incredibly loud engine considering we were a few miles away and it was indoors. Next, the B-1s finally lit their afterburners and launched into the night sky. The launch was already pretty far behind so we decided to call it a night to prepare for tomorrow. We ended up hearing from the pilots that the night launch didn’t finish until midnight so many of the aircraft were landing well past two in the morning. The last day of the trip we headed out to Nellis early to catch a bunch of the regular Nellis ops. The weather was great and despite the sun angle we got some decent shots of the various Weapon School and operational training squadrons. Some A-10s took off with live ordinance headed out to the range and a few F-15Es pulled a flex departure and turned right over us. The F-15Es remained very low, and one was on afterburner. We even caught the Thunderbirds coming back from a practice demo. 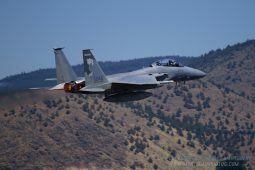 The Red Flag launch started and some California ANG F-15Cs that played the role of additional aggressors pulled the flex departure on the way out, giving us a good angle on the Eagle squadron art on the tail. The B-1s proceeded with their afterburner take off, and then it was all fighters and some C-130s thrown in there as well. The RAF C-130 was completely covered with dirt along the fuselage from landing at either Keno Airfield or some other dirt airfield out in the NTTR. The clouds started to move in and many of the shots were becoming dark silhouettes rather than the normal detailed shots with a nice blue sky in the background. With the recovery, the clouds only got thicker, but as it got closer to sunset the clouds that were closer to the horizon were more orange so it was a decent background for some silhouette landing shots. Finally, the last of the tankers landed, and we concluded our time at Red Flag 16-1.